This amazing facial cream with pure Rosehip Oil, and with the added protection of SPF 15 is a must for all those who care about their skin. 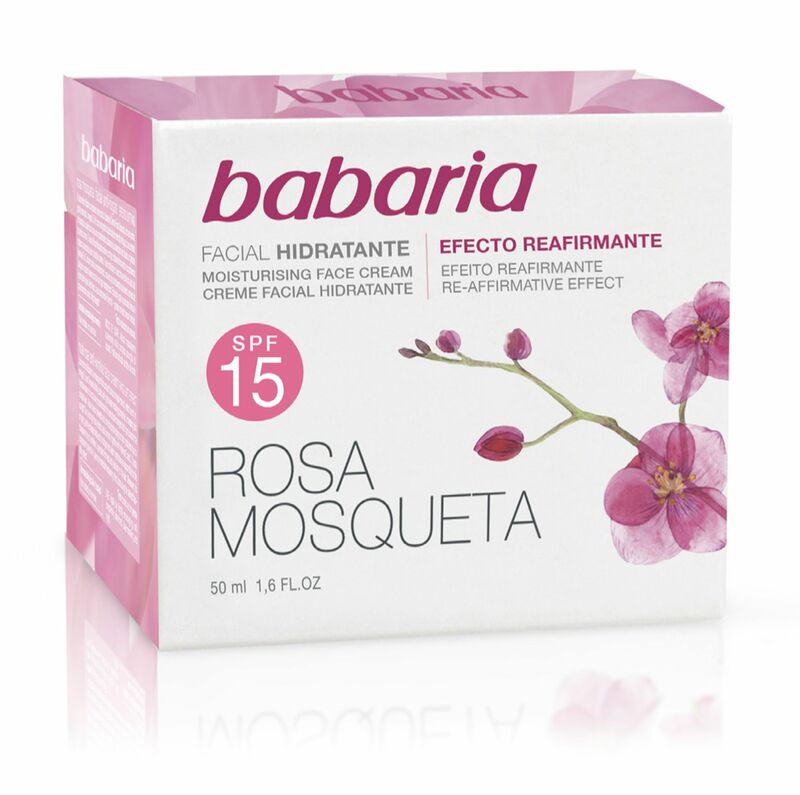 This remarkable moisturiser from Babaria helps restore and improve the quality of skin tissue. This daily moisturizer which is rich in omega 3,6 and 9 essential fatty acids helps to minimize the look of lines and wrinkles and strengthen skin’s resistance to the environment whilst protecting it from the harmful rays of the sun. Rosehip Oil is recommended for tired and toneless skin, it helps to restore optimum elasticity, gently tightening the skin to leave it smoother and younger looking. Research has shown Rosehip Oil to have remarkable results when applied to sun damaged skin and expression lines as well as old acne scars. • Contains SPF 15 to help protect you skin from the suns harmful rays. Aqua, Octocrylene, Rosa Moschata Seed Oil (5% Aceite Rosehip Oil), Cyclopentasiloxane, Ethylhexyl Methoxycinnamate, Glycerin, Butyl Methoxydibenzoylmethane, C12 – 15 Alkyl Benzoate, Isoamyl p-Methoxycinnamate, Cetearyl Glucoside, Stearic Acid, Chondrus Crispus (Carrageenans) Glucose, Pectin, Hydrolyzed Vegetable Protein, Serine, Arginine, Proline, Glyceryl Stearate, Xathan Gum, Phenoxyethanol, Methlparaben, Ethylparaben, Acrylates C10 – 30 Alkyl Acrylates Crosspolymer, Sodium Hydroxide, Parfum, EDTA Tetrasodium, BHT, Paraffinum Liquidum, Ascorbyl Palmitate, 2-Bromo-2Nitropropne-1, 3-Diol.